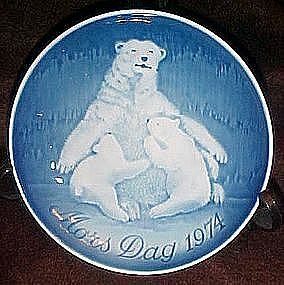 Nice blue and white Mothers day plate by Royal Copenhagen, Bing & Grondahl and artist Henry Thelander. It depicts a mother polar bear and her two cubs. Dated 1974. Measures almost 6" in diameter. Pristine condition and has its original paperwork. No box.